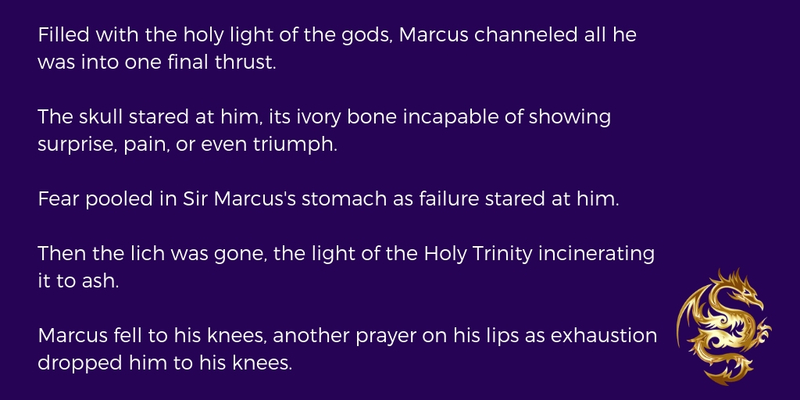 Filled with the holy light of the gods, Marcus channeled all he was into one final thrust. The skull stared at him, its ivory bone incapable of showing surprise, pain, or even triumph. Fear pooled in Sir Marcus’s stomach as failure stared at him. Then the lich was gone, the light of the Holy Trinity incinerating it to ash. Marcus fell to his knees, another prayer on his lips as exhaustion dropped him to his knees.